The Dutch pension system is designed with a public tier, as well as quasi-mandatory occupational and voluntary private pension arrangements. The public pension is funded by the Algemene Ouderdoms Wet (AOW) Savings Fund, which is designed to cope with future demographic challenges. The system is financed through tax revenues and expected to grow to €135bn in 2020 when assets are needed to finance increased public pension expenditures. The first pillar is a compulsory insurance plan financed on a pay-as-you-go basis. The system covers employees in the private sector, civil servants and the self-employed. Contributions are paid on income at a rate of 17.9%, which is employee-financed and until 2028 the state pension will be guaranteed to rise in line with inflation. Benefits are adjusted according to changes in the minimum wage and are subject to income tax. A full old-age pension is paid to those who have resided for 50 years in the Netherlands between the ages of 15 and 65. As every year amounts for 2% of the total savings, everyone who has not been living in the Netherlands for the full period or wants to stop working before the retirement age will have their pension deducted by 2% per year Due to an ageing population the government last year decided to increase the retirement age to 66 years in 2020 and to 67 in 2025. More incentives will be introduced to work past the retirement age. Employers will receive a mobility bonus for employing elderly workers and for those that work beyond retirement, there will be a 6.5% increase to the state pension. However, for those that retire early, they will receive 6.5% less. The new legislation will ensure ongoing pension provision for young and old at a saving of 0.7% of the country's GDP. The Dutch second pillar is one of the best developed occupational pension systems in Europe. Although occupational pension provision is generally not mandatory, sector-wide pension schemes often stipulate compulsory membership that can be approved by the Ministry of Social Affairs and Employment upon request. Eighty percent of all occupational scheme members are covered by mandatory sector-wide pension funds. Opting-out of sector-wide pension schemes is possible in case the employer establishes a company pension plan that provides benefits of at least an equivalent level. Pension funds can be either company funds or industry-wide funds. 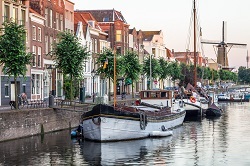 A supervision framework, which is now compulsory for Dutch pension funds, seeks to make the Dutch retirement system more secure by adopting risk-based solvency requirements. The FTK framework (Financieel Toetsingskader) frames rules for the valuation of liabilities of pension funds. Pension schemes that fail to meet the requirements are faced with sanctions, including fines for employers. Underfunded plans have to achieve the minimum funding within one year to avoid the intervention of the DNB (De Nederlandsche Bank). In addition, a recovery plan with a maximum recovery period of 15 years has to be established if the plan fails to achieve the target funding level. Most employees contribute to a defined benefit plan on the basis of a percentage of their pensionable salary. This percentage usually varies between 4% and 8%. The employer contribution is determined by the funds actuary or the insurer. For defined contribution (DC) plans, employees tend to contribute about one-third of the overall contribution, with two-thirds coming from the employer. Smaller companies often provide fully insured pension plans. This can be done by individual insurance contracts or by group insurance contracts. Group annuity contracts are commonly used to fund benefits for pensioners. These contracts also often provide pre-retirement death and disability benefits. The tax treatment of contributions and benefits is the same as for pension funds.